We must be nuts... or as our friend Marion describes us... CITY SUCKERS. 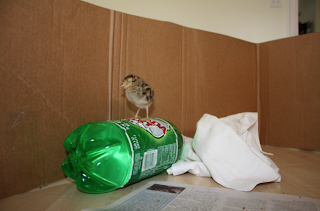 We are now raising and caring for a baby ring neck pheasant. We wanted to wait to post about him to see if he made it through a few days. John was watering the garden Friday afternoon and heard chirping... when he turned to look he saw this baby... then mama came by...then ran off when she saw John. John then left the garden to give them some space and went to water a new hedge we planted when he saw mama and baby together again about 200 feet away. About a half hour later I saw little baby wandering the yard chirping it's fool head off all alone. They got separated. 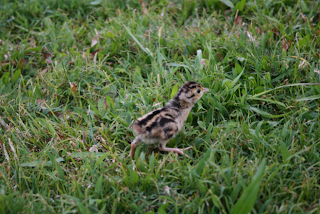 It wandered the yard for 3 hours chirping for it's mama. We watched it's every move from afar so that mama would not be spooked by us and so that we could protect it from the nasty clutches of the area cats (sorry D&E). We finally left it to it's own devices after 1 1/2 hours and went back to our chores. We could hear it chirping away.... our hearts breaking with every chirp. When I walked up to the back deck around 7:00 pm Friday, it had just run underneath it where it stayed the night... which was cold and windy. It went so far under that we could not reach it. 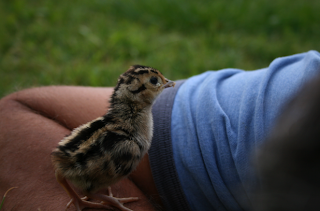 We kept taking it in the yard so it could chirp for mom... after 4 hours we ended it and decided to raise him on our own. We have taken him on outings to call for mom several times but no luck. Saturday we packed him up and went to the feed store and bought wild game chick feed which he has been eating very well. Yesterday was a real breakthorugh as he started drinking from his dish on his own. No more drinking from my fingertip. He is also very active. They think it's about 3 weeks old. We are so happy to wake up every morning and find him still breathing. After eating it's time to get back in the hand and pass out... Just to do it all over again in 30 minutes. He loves being in our hands to sleep... but I cannot have him in hand all the time so I have to carry him in my sweatshirt pocket which he LOVES!. When he sleeps he chirps so soft the entire time. Here is the heat source we have devised... a bottle full of hot water. HE LOVES IT as evidenced here... standing and sleeping. He could not even wait until we wrapped it. I have also made a hot water bed with a zip lock bag filled with hot water... and a tent over that. Another favorite spot. We have named him Kekoa which means courageous one. Like we have nothing else to do...oh well. Too cute! We can't stand it! Oh and save the comments about dinner! I know SOME of you too well! 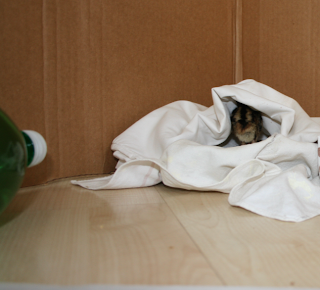 It seems you did everything possible in the first days - not to interfere with BabyBirdy's separation from MamaBirdy. Now that you two seem to be the Official Mommies, BB has the best chance ever to thrive. 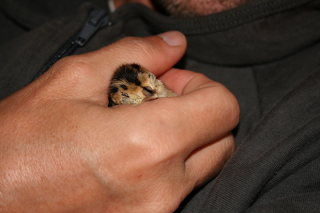 Years ago, friends of mine hatched a California quail from an abandoned egg. 'Peepers' is still a part of their family! 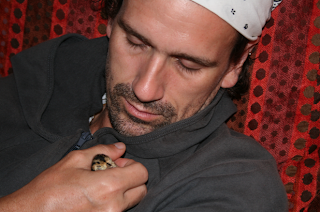 I sense your nurturing skills are finely honed, and there's definitely BIRDYLOVE in your eyes! I cant Stand it! Its Fabulous! Like an After School Special on TV or Old Yeller??? or something. I heard the story first hand over the phone line but the pics and text bring it all together. Sooooooo cute. Brilliant. Best post ever... Infinity.